11 A None No Power Seat 11 A is a standard Business Class seat that may have restricted legroom due to the position of the bulkhead. 11 C None No Power Seat 11 C is a standard Business Class seat that may have restricted legroom due to the position of the bulkhead. 11 D None No Power Seat 11 D is a standard Business Class seat that may have restricted legroom due to the position of the bulkhead. 11 G None No Power Seat 11 G is a standard Business Class seat that may have restricted legroom due to the position of the bulkhead. 11 H None No Power Seat 11 H is a standard Business Class seat that may have restricted legroom due to the position of the bulkhead. 11 K None No Power Seat 11 K is a standard Business Class seat that may have restricted legroom due to the position of the bulkhead. 16 A None No Power Seat 16 A is a standard Business Class seat whose proximity to the lavatories and galleys may be bothersome. 16 C None No Power Seat 16 C is a standard Business Class seat whose proximity to the lavatories and galleys may be bothersome. 16 D None No Power Seat 16 D is a standard Business Class seat whose proximity to the lavatories and galleys may be bothersome. 16 G None No Power Seat 16 G is a standard Business Class seat whose proximity to the lavatories and galleys may be bothersome. 16 H None No Power Seat 16 H is a standard Business Class seat whose proximity to the lavatories and galleys may be bothersome. 16 K None No Power Seat 16 K is a standard Business Class seat whose proximity to the lavatories and galleys may be bothersome. 31 F None No Power Seat 31 F is a standard Economy class seat that may have restricted legroom due to the position of the bulkhead. 31 G None No Power Seat 31 G is a standard Economy class seat that may have restricted legroom due to the position of the bulkhead. 31 K None No Power Seat 31 K is a standard Economy class seat that may have restricted legroom due to the position of the bulkhead. 40 A None No Power Seat 40 A is a standard Economy class seat however, the proximity to the lavatories may be bothersome. 40 C None No Power Seat 40 C is a standard Economy class seat however, the proximity to the lavatories may be bothersome. 40 D None No Power Seat 40 D is a standard Economy class seat however, the proximity to the lavatories may be bothersome. 40 E None No Power Seat 40 E is a standard Economy class seat however, the proximity to the lavatories may be bothersome. 40 F None No Power Seat 40 F is a standard Economy class seat however, the proximity to the lavatories may be bothersome. 40 G None No Power Seat 40 G is a standard Economy class seat however, the proximity to the lavatories may be bothersome. 40 H None No Power Seat 40 H is a standard Economy class seat however, the proximity to the lavatories may be bothersome. 40 K None No Power Seat 40 K is a standard Economy class seat however, the proximity to the lavatories may be bothersome. 41 A None No Power Seat 41 A is a standard Economy class seat that has extra legroom however, the proximity to the lavatories may be bothersome. 41 C None No Power Seat 41 C is a standard Economy class seat that has extra legroom however, the proximity to the lavatories may be bothersome. 41 G None No Power Seat 41 G is a standard Economy class seat that has extra legroom however, the proximity to the lavatories may be bothersome. 41 H None No Power Seat 41 H is a standard Economy class seat that has extra legroom however, the proximity to the lavatories may be bothersome. 41 K None No Power Seat 41 K is a standard Economy class seat that has extra legroom however, the proximity to the lavatories may be bothersome. 48 A None No Power Seat 48 A is a standard Economy class seat that has extra legroom due to the angle of the seat. 48 C None No Power Seat 48 C is a standard Economy class seat that has extra legroom due to the angle of the seat. 48 H None No Power Seat 48 H is a standard Economy class seat that has extra legroom due to the angle of the seat. 48 K None No Power Seat 48 K is a standard Economy class seat that has extra legroom due to the angle of the seat. 51 D None No Power Seat 51 D is a standard Economy class seat however, this seat may have restricted legroom due to the transition from 4 to 3 seats, making this seat misaligned with the one in front. 51 E None No Power Seat 51 E is a standard Economy class seat however, this seat may have restricted legroom due to the transition from 4 to 3 seats, making this seat misaligned with the one in front. 51 G None No Power Seat 51 G is a standard Economy class seat however, this seat may have restricted legroom due to the transition from 4 to 3 seats, making this seat misaligned with the one in front. 53 G None No Power Seat 53 G is a standard Economy class seat however, the proximity to the lavatory may be bothersome. 53 H None No Power Seat 53 H is a standard Economy class seat that may have limited recline. The proximity to the lavatory and galley may be bothersome. 53 K None No Power Seat 53 K is a standard Economy class seat that may have limited recline. The proximity to the lavatory and galley may be bothersome. 54 A None No Power Seat 54 A is a standard Economy class seat that may have limited recline. The proximity to the galleys may be bothersome. 54 C None No Power Seat 54 C is a standard Economy class seat that may have limited recline. The proximity to the galleys may be bothersome. 54 D None No Power Seat 54 D is a standard Economy class seat that may have limited recline. The proximity to the galleys may be bothersome. 54 E None No Power Seat 54 E is a standard Economy class seat that may have limited recline. The proximity to the galleys may be bothersome. 54 G None No Power Seat 54 G is a standard Economy class seat that may have limited recline. The proximity to the lavatory and galley may be bothersome. Hainan Airlines offers a wide variety of music onDemand. This aircraft offers a personalized entertainment system in both cabins, with a selection of approximately 50 movies, 10 games, and a 3D electronic map so you can keep track of your flight's location. The system operates in Chinese, English, and French and is controlled by a handset or touchscreen. The in-seat widescreen TV monitors are 10.6 inches for Business class and 8.9 inches for Economy. 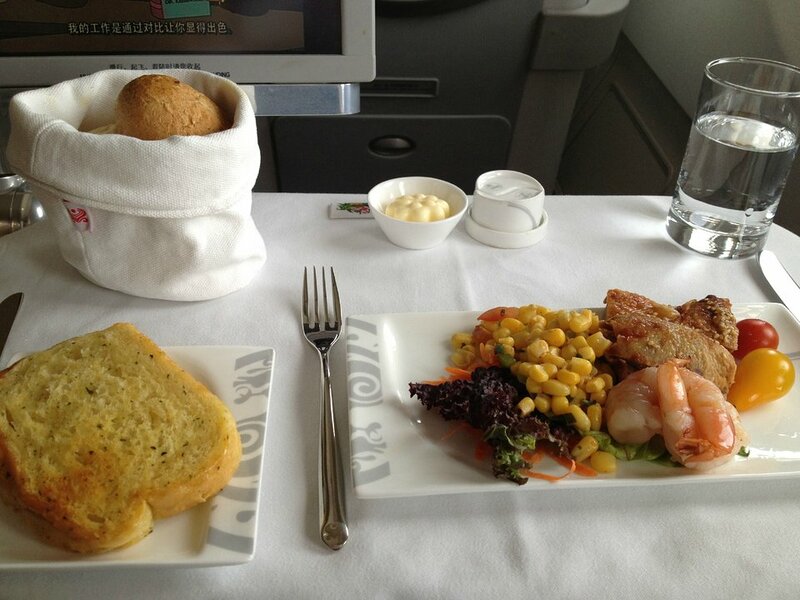 Hainan Airlines serves complimentary meals, alcoholic beverages, and soft drinks. Hainan Airlines' Airbus A330-200 is flown in a two class configuration with 36 flat bed Busniess Class seats and 186 standard Economy Class seats. 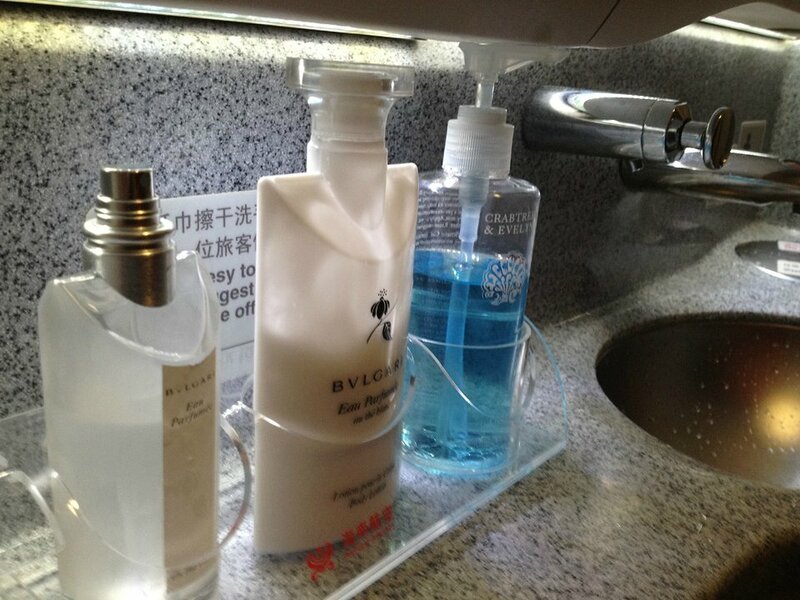 Business class features such amenities as plush silk pillows, slippers, and an onboard espresso machine. 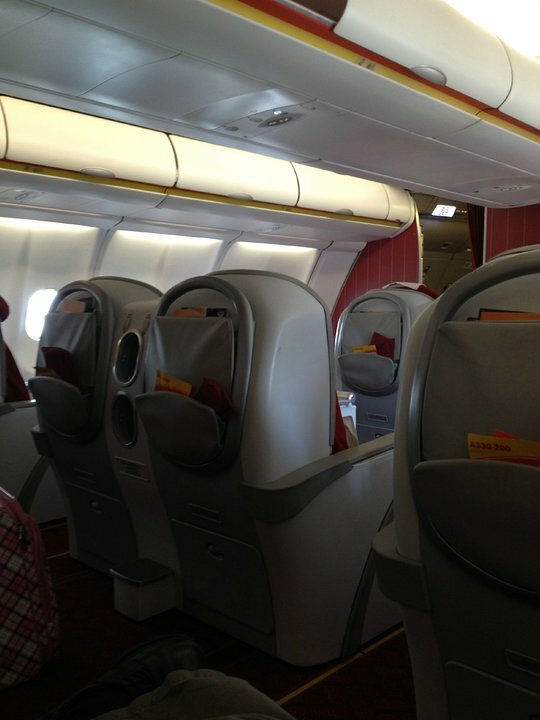 Hainan Airlines flies 1 versions of Airbus A330-200.